Do you think it’s better to get a puppy or adopt an adult dog? Puppies have a lot of energy, they’re learning about the world, and they can be a lot of work. Then, just as many dog owners think the puppy grew to an adult, they actually have a teenager. Some breeds aren’t considered adults until they’re around three years old, and that means a couple of years with a full-size dog brimming with puppy energy and ideas. Many people love this time and think it’s a lot of fun. If you’re one of them, a puppy might be a perfect choice. If you’re unsure about putting in the time and energy a puppy needs, an adult dog may be the better way to go. Some people think an adult pet won’t bond with them the same way a puppy or a kitten would, but that’s not true. Give it a little time and enjoy life together. Many adult dogs wait in shelters, hoping for a second chance. Most aren’t there through any fault of their own. The owner’s family, living situation, or financial situation changed. Or, the dog got lost and was never reunited with the family. When you see a pet in a shelter, remember they’re stressed. 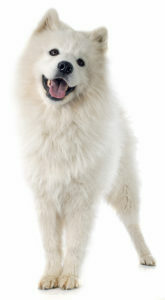 Many dogs shut down in the unfamiliar environment and become shy and unresponsive. Others are hyper alert, ready to take any chance to get away. The pet’s personality can change once they’ve settled into their new home. This process can take a couple of weeks – they need a chance to figure out they’re home and safe. If you adopt a grown dog, you know important things like their final size and grooming requirements. Older dogs are far less likely to be destructive chewers than younger dogs – and if they chew on something they’re bored, not teething. Older dogs are also more likely to be house trained than puppies. Many believe older dogs can’t learn new tricks. Truth is, they usually have more ability to focus than a puppy. Training is a great mental exercise, and helps build the bond between you and your new best friend. Whether you opt for a puppy or an adult, consider the breed. Dogs of the same breed can have completely different personalities of course, but different types of dogs tend to have different behaviors. That is, the typical Border Collie will act and react differently than the typical Boxer, who will act and react differently than the typical Chinese Crested.